Haunted attractions, also known as haunted houses, have become a multibillion-dollar industry attracting millions during the Halloween season. In the past, these attractions utilized simple scares and store-bought masks, but haunt enthusiasts have become much savvier during the past decade. For instance, many places now use Hollywood quality special effects and props to entice visitors into spending $20 or more per visit. Although you can still find haunted attractions built into temporary trailers, the very best locations are housed in buildings where the owners have access to all year. Instead of a quick throw-together, they’re able to make several alterations to the show before each season begins, providing the scares that keep people coming back every October. There are hundreds of haunted attractions located throughout the United States. Known as the Haunted Attraction Capital of the World, Michigan’s Metro Detroit area boasts more of these attractions per capita than any other area. However, our list of Top 10 Best Haunted Attractions of 2015 illustrates the fact that haunters across the nation are well-versed in the art of making people scream. Visitors to the 13th Gate in Baton Rouge are taken on a self-guided tour of 13 distinctly different areas intended to represent the 13 circles of Hell. This haunt spans 40,000 square feet and incorporates indoor and outdoor areas, so ticket holders feel like they are exploring everything from an ancient skull pit to a Louisiana swamp. There are two different types of haunted attractions: those intricately detailed and those simply in your face. The 13th Gate is definitely the former, and without hyperbole it is by far one of the most beautiful haunted houses in America. However, this beauty doesn’t come in the conventional sense. Instead, haunt lovers will marvel at the astounding amount of detail placed in each room, perfectly complementing the high-quality actors and effective scare scenes. Anyone who’s ever visited The House of Shock in New Orleans is aware it’s very different from the typical haunted attraction. For starters, there’s live music, pyrotechnics and a freak show you can enjoy outside of the haunt itself. Additionally, this attraction takes more of a no rules approach than most of the other haunts in the nation, meaning you could be touched or even shoved by one of the actors. Perhaps the most shocking aspect of The House of Shock is the haunt’s theme based on the seedy underbelly of New Orleans. Visitors are encouraged to watch outlandish simulations from what has been dubbed the Church of Satan. It’s not unusual to see props people might think are in poor taste such as dead prostitutes who’ve had the flesh flayed from their bodies. The literally in your face approach to this attraction is what makes it so effective and entertaining for visitors. The House of Shock announced it was closing in 2014 after more than 20 years, but they recently changed course after receiving assistance from an anonymous investor. The 2015 show has been named The House of Shock Presents: The Resurrection. The owners of Erebus have spoken quite proudly about the fact their haunt is scarier than it is pretty. Don’t let this statement fool you, though, because, in reality, Erebus does pay a lot of attention to detail. However, it’s definitely fair to say they place more of their focus on creating innovative scares that will stick with you well after you’ve exited the second longest walk-through haunted house in the world. Erebus is housed within a four-story building in Metro Detroit, and the owners have taken full advantage of all of that space to create different dimensions in time to go along with their time travel theme. During a trip to Erebus, haunt enthusiasts will experience the sensation of being buried alive and getting lost in a very foggy swamp. The quality of actors, makeup and props is typically superb at Erebus, taking an average party about 45 minutes to complete the experience. Consistently for the past several years, Netherworld’s been listed as one of the top haunted attractions in the U.S. in no small part due to it’s high level of creativity and originality. This haunted house attraction on the outskirts of Atlanta garnered raved reviews from horror mag, Fangoria, writing that Netherworld “is the #1 Hometown Haunted House in America.” On top of that, this venue hosts two haunted houses for you to explore while crying out for your momma. Annually, the haunt picks a new theme and redesigns many aspects of the attraction to ensure repeat visitors have unique experiences. Netherworld’s also credited with being among the first haunts to utilize buttons on the floor to alter the show. They’re also highly committed to using only the finest quality actors, props and set designs. Netherworld opens on September 25, so go to Atlanta for a little Southern charm in the city and crazy mayhem at the haunted house this Halloween. Nster News calls this haunted house, “One of the Scariest Places on Earth!” Headless Horseman Hayrides and Haunted Houses doesn’t disappoint, and visitors have more than one way to get their fright on. This haunts puts on a truly phenomenal show, but everyone who makes the trip to Ulster Park should also check out the hayride. In fact, the hayride portion alone is rated one of the top haunted hayrides in the country. Now that’s saying something when you consider the plethora of haunted carriages littering the Halloween season. The Headless Horseman stands apart from its competitors by employing an impressive staff of approximately 350 people who nightly treat people to their worst fears. Image courtesy of Headless Horseman Hayrides and Haunted Houses via Facebook. The Darkness has been consistently rated the best haunted attraction in the St. Louis area during its 21-year history and the owners continually add action to ensure they stay on top. For example, visitors to The Darkness can also enjoy the Terror Visions 3D Haunt and the intriguing Monster Museum. All of these attractions are in one location and accessed for one price. Such a deal! The main haunt incorporates highly detailed set designs, skilled actors, quality makeup and a large amount of entertaining misdirection to keep every ticket holder on the edge of their proverbial seat. Recently the live actors were given the go-ahead to interact with visitors much more intimately via direct contact. A fantastic way to get your adrenaline pumping! Until 2009, Erebus was the Guinness Book of World Records holder for the designation of the largest walk-through haunted house in the world. Cutting Edge Haunted House was pleased to take this honor away from the Pontiac haunt, and they’ve managed to hold onto it for six years so far. This attraction takes approximately one hour to complete, and unlike other haunts, they don’t give ticket holders any specially designated places to catch their breath. In other words, the scares will keep coming throughout the entire hour, and you’ll barely have a chance to breath. An intense experience for sure that surely explains why Cutting Edge Haunted House always earns a regular spot on most top haunted house lists. This location was also named one of the scariest haunts in the country by the Travel Channel. Anyone in the Fort Worth area who enjoys Halloween and haunted houses will most assuredly have a highly entertaining and terrifying experience at this quality attraction. One of the most enduring haunted houses in the world, The Beast will soon be open for its 41st season. This attraction is actually part of a larger network of haunted attractions located in the same general area, so it’s easy for haunt lovers to spend an entire evening enjoying a diverse selection of scares. The Beast was groundbreaking when it first opened because it was the only attraction incorporating live alligators, an open format and front door entertainment. Flash forward to today, it’s now common for haunts to have scare actors outside to keep people pumped up while waiting in line. For most, exploring a haunted house can be scary enough on its own, but visiting a location that once housed a long list of deadly criminals takes things to a whole new level. Terror Behind the Walls is held inside the Eastern State Penitentiary. For an even creepier experience, visitors are asked to park at the zoo and take a ghost shuttle to the prison. Leaving your car behind enhances the feeling of isolation and imprisonment that comes over you as soon as you walk through the entrance. This haunt takes full advantage of the environment, treating ticket holders as if they’re incoming prisoners. You’ll work your way through six different attractions located within the 11 acres abandoned facility, and you can also check out the prison museum to learn more about the location’s dreadful history. As a bonus, the Eastern State Penitentiary is considered to be a hotspot for paranormal activity. It’s definitely possible you may encounter scares other than those of the people working for Terror Behind the Walls. The dedicated actors are outfitted with extremely well-designed costumes and makeup, truly pulling you into the experience. Expect to see creepy creations inside and outside the cells, and you will be asked to make a choice between a truly interactive encounter or being merely a spectator. Anyone agreeing to the interactive option is fair game to being pulled out and separated from the group. Don’t be surprised when you find yourself lost inside hidden passageways that might seem impossible to escape from. Except for The House of Shock, the other entries on this list are scary and enjoyable without crossing over certain generally accepted guidelines for a haunted attraction. Fortunately, if you have an appetite for a different experience, one that will take you far outside of your comfort zone, you can turn to the Haunted Hoochie at Dead Acres. It’s clear from the name Haunted Hoochie that its owners don’t believe in providing a watered-down experience. Instead, you’ll face adult-themed subject matter intended exclusively for mature audiences. We should also mention there’s a good possibility you’ll end up becoming part of the show or at the very least, physically separated from your group. 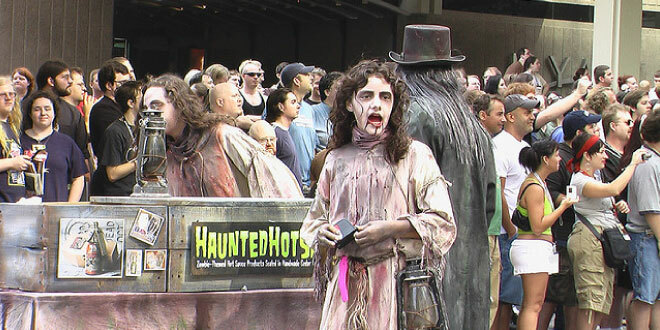 Be aware, this haunt’s considered one of the most extreme attractions in the world and absolutely not appropriate for small children or people easily disturbed by violent imagery or unexpected physical contact.